For example, the US Food and Drug Administration (FDA) approved only seven official indications for using IVIG, including primary immunoglobulin deficiency (PID), idiopathic thrombocytopenia purpura, Kawasaki disease, chronic inflammatory demyelinating polyneuropathy (CIDP), multifocal motor neuropathy, chronic lymphocytic leukemia, and passive immunity. It should be noted that strong evidence or experts' opinion also support some of the off-label indications for the use of IVIG, suggesting it is considered efficacious.,, Although some of these IVIG indications are only supported by limited data, these off-labeled indications are still considered in practice by many consultant and academic physicians. It must be noticed that over 150 unlabeled use of IVIG exceed the FDA labeled indications and attributed for the most IVIG usage with a considerably high cost. Consequently, concerns for increasing the rate of IVIG irrational prescribing and associated cost in the world made us to determine the prescribing and administration pattern of IVIG in one of the largest hospitals in the Middle East region and to find the possible factors which can affect the misuse of IVIG. This cross-sectional research was carried out at one of the largest hospitals in Iran which are located in Isfahan and is affiliated with Isfahan University of medical sciences during a 9-month period, and the data were collected prospectively. The hospital information system (HIS) was used to find and identify the patients who received IVIG, and 201 patients were randomly recruited to the study from different wards of the hospital based on the proportion of the previous usage of IVIG in these wards. Demographic characteristics, medical condition which was the reason for prescribing IVIG, dose amount and regimen, rate of administration, pre-medication and hydration status of patients before IVIG administration, related adverse effects and the physicians' sub-specialty were recorded from the medical records and electronic data of the HIS on a daily follow-up basis. To evaluate the concordance of IVIG indications with the standard and rational prescribing guidelines, we sub-categorized the identified indications of IVIG in to three main categories, in accordance with the Lexicomp IVIG drug information: (a) FDA labeled indications, (b) off-labeled with support (strong evidence suggest its efficacy), and (c) off-labeled with no support (there is not any, or sufficient evidence to justify its usage). In our study, IVIG indications in the categories, A and B were flagged as appropriate, whereas category C indications were considered inappropriate. 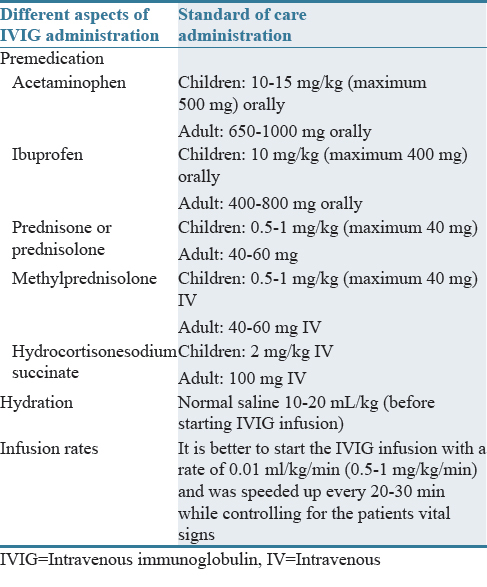 Other details and considerations such as the rate of administration, pre-medications, and hydration before IVIG administration were also compared with their standards of care as summarized in [Table 1]. Cost of IVIG misuse, patient outcomes, mortality rates, and factors related to IVIG's inappropriate usage was also recorded, and identifiable risks related to prescribing this drug were also reported. The collected data were analyzed using the 20th version of SPSS statistical computer software (IBM, USA). Frequencies and percentages were used to report the qualitative data, whereas the quantitative results were expressed by the mean and standard error [SE]. The normal distribution of data was confirmed by the Kolmogorov–Smirnov test. Independent sample t-test and Chi-squared test were performed to compare the quantitative and qualitative variables between two independent groups, respectively. Furthermore, the one-way analysis of variance (ANOVA) test was used to assess the significant differences of continuous variables in more than two different groups and the Kruskal–Wallis test was used to assess these differences when the assumptions of one-way ANOVA were not met for the nonparametric data. Logistic regression analysis was also used to assess the associations between variables and the misuse of IVIG. Univariate regression analysis verified the importance of each variable, and after that, multiple logistic regression analysis was performed to evaluate the association between the previously significant risk factors and the IVIG misuse. Value of P ≤ 0.05 was considered statistically significant. The study protocol conformed with the requirement of the Ethical Committee at Isfahan University of Medical Sciences and approved by its Institutional Board of human studies (registration number: 393649). A total of 201 patients, who received IVIG during the 9-month period of the study were included and analyzed. They mainly included adults with the mean age of 43.4 ± 1.3 years old, whereas, only 20.9% of patients were children, who had the mean age of 9.7 ± 0.8 years. IVIG prescribed by neurologists included 48% of the total IVIG prescriptions in our study, followed by clinical immunologists (35%), hematologists (4%), rheumatologists (3.5%), nephrologists (3.5%), dermatologists (2%), infectious disease specialists (2%), and neonatologists (2%). IVIG was given for 26 different indications in our study and the appropriate indication (categories A and B) represented for 72% of the total IVIG indications. 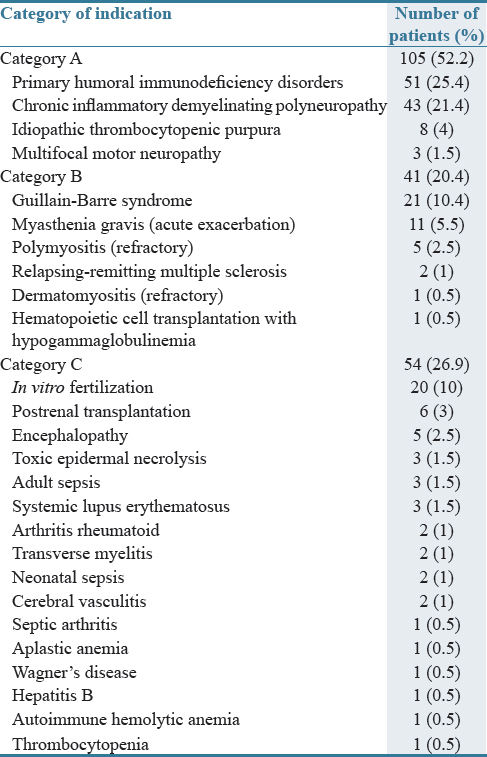 Distribution of IVIG indications among the three main categories and the number of patients received IVIG for certain indications were given in detail in [Table 2]. The mean dose of prescribed IVIG during the treatment cycle of the study was 0.43 ± 0.14 mg/kg, and the Kruskal–Wallis test showed that this value was significantly higher in ICU patients than other patients (P = 0.004). All the variables were analyzed to identify and evaluate the potential factors affecting the misuse of IVIG. According to univariate analysis, a significant increase in the risk of IVIG misuse had been observed in the older population and female patients (P < 0.001). Hospital ward admission was also a major predictor of IVIG misuse in univariate analysis. Furthermore, this analysis showed administration of IVIG in the day clinic was more appropriate than other wards (P < 0.001). Moreover, the specialty of neurology was another factor, which significantly predicted the appropriate use of IVIG in our study (P < 0.001). However, when the multivariate model was developed, only the factors of female gender, older age, and longer time to start IVIG administration from hospital admission remained statistically significant (P < 0.001, 0.024, and 0.007, respectively) [Table 3]. In our studied patients, hydration and pre-medications before using IVIG were not adequately applied for more than half of the patients (60.7% and 50.7%, respectively). However, 96% of the patients received IVIG with the safe administration rate. Overall, 142 (70.6%) patients did not show any adverse reactions, whereas systemic (fever, headache, nausea, vomiting, and back pain) and allergic reactions occurred in 28.9% and 0.5% of patients, respectively. The rate of IVIG infusion and re-medication significantly influenced the prevalence of systemic adverse reactions [Table 4]. Finally, in our studied patients, 8 out of 201 patients (4%) died during the follow-up period. Two-third of the dead patients had an inappropriate indication for using IVIG, which was statistically significant according to statistical analysis (P = 0.007). However, the duration of hospitalization was not significantly different between the groups (P = 0.476). The brands of IVIG used in the study were Intratect® (Biotest Pharma GmbH, Germany), Privigen® (CSL Behring AG, Switzerland) and I. V.-Globulin SN (Green Cross Corporation, Korea) with the same average cost per gram of 46 US $ (in 2016). The total cost of inappropriate used IVIG in each patient was calculated by multiplying the sum of the inappropriate gram of used IVIG with the cost of each gram of IVIG. Our results showed most of the cost of IVIG (75.4%) was dispensed for appropriate indications, while the corresponded cost of inappropriate usage was also considerable, amounting to nearly 180000 US dollar for 54 patients. Understanding the factors affecting the misuse of medications will enable the health providers in the implanting program to prevent inappropriate use of them, and medication use evaluation (MUE) is the cornerstone in this manner. Limited worldwide availability of IVIG, increasing the demands for unlicensed use, and escalating costs, in addition to possible adverse reactions and inadequate information for IVIG use, especially in the Middle East, has been remained the evaluation of IVIG misuse as one of the priorities of MUE for several years.,, Therefore, this study was designed to describe the use of IVIG in one of the largest academic tertiary referral hospitals in a developing country in the Middle East. In particular, the possible factors, which might associate with the misuse of IVIG were reported properly. Furthermore, prospective description of different characteristics of IVIG use such as the dose, type of pre-medication, hydration, the rate of infusion, adverse drug reactions, and the outcomes can distinguish this study from previously conducted studies. A significant higher dose of IVIG prescribed in ICU patients confirms the fact that the anti-inflammatory and immunomodulatory effects of IVIG, mainly required in the treatment of ICU patients represented in higher doses than the amount used for the immunodeficiency purposes. Despite the existence of some data regarding the IVIG use evaluation in the literature review, there was not enough information regarding the variables related to the misuse of that. We found that older age, longer time spent from admission to start IVIG and the female gender to have a significant association with the misuse of IVIG. IVIG may be considered as the last therapeutic option for the patients' survival, and attending physicians prescribe it even when there is not sufficient evidence to support the required use of the substance, which could explain that the longer time required to start IVIG from admission in these inappropriate indications. However, we could not find clear reasons to explain how demographic characteristics could affect the misuse of IVIG. The most frequent adverse reactions in our study were the systemic reaction (about 30%), which is compatible with the declared prevalence of 20%–50% in the previous studies. Moreover, another study conducted in a teaching hospital in Yazd/central Iran revealed that 26.7% of the study population developed adverse reactions (mainly mild reactions) to the IVIG in that study. Our results showed that the infusion rate and pre-medication significantly affected the occurrence of adverse reactions, which is compatible with the medical literature. However, the brand of IVIG and hydration did not have any significant effects on these reactions. The recent review of adverse reactions of IVIG declared that the most reported adverse reactions of IVIG are associated to the infusion rate. Furthermore, appropriate hydration may also reduce the incidence of delayed or late events such as a migraine headache, aseptic meningitides, deep vein thrombosis (DVT), and renal impairment, and its role to decrease the systemic reactions is imprecise. Although adverse effects, known to be associated with IVIG, were reported in our study, they were limited by some confounders. For instance, the systemic reactions such as fever, nausea, and vomiting or back pain might be attributed to many conditions, in which IVIG was prescribed. On the other hand, some adverse reactions such as DVT or renal insufficiency were delayed and could not be detected in a limited time of our study. Moreover, they could be contributed to other conditions with similar adverse reactions. The low hospital mortality presented in our study is compatible with some previous studies. However, it is much lower than mortality rate (55%) reported among ICU patients. The high rate of mortality could be related to the critical condition of these patients, whereas in our study, >60% of patients received IVIG in the day-clinic. Besides, our results showed that the mortality was also significantly higher among patients with inappropriate indications. Even though this study opened a new window to look into the various aspects of IVIG use, it should be mentioned that these data may be limited by some factors. First, this study was conducted in a regional hospital over a short period. Second, our population may not be suitable represent for all groups of patients, especially in the pediatric practice. On the other hand, the results in the referral university hospital with rare diseases and refractory patients to conventional therapy may be different to that from other hospitals. However, different policies have been implemented in clinical settings to control the IVIG prescription, but at the time of our study, the IVIG was dispensed according to the physician orders without any control on its use in our center. Thus, it was necessary to use an approved guideline to control the substance use in different wards of the hospital and provide the opportunity for effective feedback to develop and revise this guideline. Therefore, after completing this study, a clinical guideline was introduced in this tertiary, academic center by the drug hospital committee in collaboration with the expert specialists. Afterward, the month-by-month analysis of the IVIG use could be performed to assess the possible changes in the IVIG use after implementation of the guideline. However, the expert opinion for the use of IVIG in the off-label (without sufficient evidence), but life-threatening condition would limit this practice which was also mentioned in previous studies. Because of the different interpretation of clinical evidence by the specialists, the acceptability of unlabeled indications of IVIG is inconsistent in various guidelines of healthcare institutions. However, the institutional guideline is necessary for the delineation that patients benefit from the IVIG use and limit prescription of IVIG for the unlabeled indications by the implementation of some control mechanisms. In this prospective study, >70% of patients received IVIG with appropriate indications defined by the FDA indications, in the academic tertiary care setting. Implementation of clinical practice guideline is necessary to limit the IVIG use for the inappropriate indications. Furthermore, more attention to patients, who are at risk for the inappropriate use of IVIG will have a significant impact on the rational use of IVIG. Moreover, the required compliance with premedication and suitable rate of IVIG infusion could limit the immediate common adverse events. Shadi Farsaei and Ali Mohammad Sabzghabaee provided the concept and the idea of the research, Zeinab Fakhari gathered the data, Shadi Farsaei and Ali Mohammad Sabzghabaee analyzed the data and prepared the drafted manuscript. All authors contributed in revising the final version and approved it for submission. We would like to thank all the nursing staff and medical officers of Al-Zahra University Hospital for their kind help and support. Perez EE, Orange JS, Bonilla F, Chinen J, Chinn IK, Dorsey M, et al. Update on the use of immunoglobulin in human disease: A review of evidence. J Allergy Clin Immunol 2017;139:S1-46. Spurlock NK, Prittie JE. A review of current indications, adverse effects, and administration recommendations for intravenous immunoglobulin. J Vet Emerg Crit Care (San Antonio) 2011;21:471-83. Orange J, Lennert B, Rane P, Eaddy M. The use of interquartile deviation in establishing delphi panel consensus: A prioritization of intravenous immunoglobulin utilization. Value Health 2015;18:A721. Leong H, Stachnik J, Bonk ME, Matuszewski KA. Unlabeled uses of intravenous immune globulin. Am J Health Syst Pharm 2008;65:1815-24. Darabi K, Abdel-Wahab O, Dzik WH. Current usage of intravenous immune globulin and the rationale behind it: The massachusetts general hospital data and a review of the literature. Transfusion 2006;46:741-53. Robinson P, Anderson D, Brouwers M, Feasby TE, Hume H; IVIG Hematology and Neurology Expert Panels. et al. Evidence-based guidelines on the use of intravenous immune globulin for hematologic and neurologic conditions. Transfus Med Rev 2007;21:S3-8. Negi VS, Elluru S, Sibéril S, Graff-Dubois S, Mouthon L, Kazatchkine MD, et al. Intravenous immunoglobulin: An update on the clinical use and mechanisms of action. J Clin Immunol 2007;27:233-45. Olafsdottir BE, Thornorsteinsson D, Einarsdottir R, Luethviksson BR, Grondal G, Erlendsson K, et al. Approved and unapproved use of immunoglobulins in Iceland. J Allergy Clin Immunol 2013;131:1703-5. Galal NM. Pattern of intravenous immunoglobulins (IVIG) use in a pediatric intensive care facility in a resource limited setting. Afr Health Sci 2013;13:261-5. Dawoud T, Tatari H, Gebran N. A utilisation review of intravenous immunoglobulin in a tertiary care hospital in united Arab Emirates. Eur J Hosp Pharm Sci Pract 2012;19:286-8. Mahadevia PJ. The pocketbook: Pharmacoeconomic issues related to intravenous immunoglobulin therapy. Pharmacotherapy 2005;25:94S-100. Dennington PM, Mondy PJ, Wood EM, Pink JM. Intravenous immunoglobulin issue policy in NSW: Australian red cross blood service clarifies ‘refusal to supply’. Intern Med J 2007;37:735-6. Orange JS, Hossny EM, Weiler CR, Ballow M, Berger M, Bonilla FA, et al. Use of intravenous immunoglobulin in human disease: A Review of Evidence by Members of the Primary Immunodeficiency Committee of the American Academy of Allergy, Asthma and Immunology. J Allergy Clin Immunol 2006;117:S525-53. Blackhouse G, Xie F, Levine MA, Campbell K, Assasi N, Gaebel K, et al. Canadian cost- utility analysis of intravenous immunoglobulin for acute childhood idiopathic thrombocytopenic purpura. J Popul Ther Clin Pharmacol 2012;19:e166-78. Lin MW, Kirkpatrick PE, Riminton DS. How intravenous immunoglobulin is used in clinical practice: Audits of two Sydney teaching hospitals. Intern Med J 2007;37:308-14. Feasby T, Banwell B, Benstead T, Bril V, Brouwers M, Freedman M, et al. Guidelines on the use of intravenous immune globulin for neurologic conditions. Transfus Med Rev 2007;21:S57-107. Ruiz-Antorán B, Agustí Escasany A, Vallano Ferraz A, Danés Carreras I, Riba N, Mateu Escudero S, et al. Use of non-specific intravenous human immunoglobulins in Spanish hospitals; need for a hospital protocol. Eur J Clin Pharmacol 2010;66:633-41. Constantine MM, Thomas W, Whitman L, Kahwash E, Dolan S, Smith S, et al. Intravenous immunoglobulin utilization in the Canadian Atlantic Provinces: A report of the atlantic collaborative intravenous immune globulin utilization working group. Transfusion 2007;47:2072-80. Immune Globulin: DRUG information. In: Waltham MA, editor. UpToDate, Post TW, UpToDate. [Last accessed on 2018 Aug 01]. Silvergleid AJ, Ballow M. Overview of Intravenous Immune Globulin Therapy. In: Waltham MA, editor. UpToDate, Post TW, UpToDate. [Last accessed on 2018 Aug 01]. Davis S, Rungruangphol PD, Gibson CM. Maximizing benefits with the medication use evaluation process. Hosp Pharm 2018;53:284-5. Foster R, Suri A, Filate W, Hallett D, Meyer J, Ruijs T, et al. Use of intravenous immune globulin in the ICU: A retrospective review of prescribing practices and patient outcomes. Transfus Med 2010;20:403-8. Hanna K, Poulin-Costello M, Preston M, Maresky N. Intravenous immune globulin use in Canada. Can J Clin Pharmacol 2003;10:11-6. Pendergrast JM, Sher GD, Callum JL. Changes in intravenous immunoglobulin prescribing patterns during a period of severe product shortages, 1995-2000. Vox Sang 2005;89:150-60. Frauger E, Grassi J, Pradel V, Bornet C, Rouby F, Delorme J, et al. Use of intravenous immunoglobulins in clinical practice: Data from three french university hospitals. Fundam Clin Pharmacol 2011;25:753-61. Sohrevardi S, Mirjalili M, Jarrahzadeh M, Mirjalili M, Mirzaei E. Evaluating the frequency of errors in preparation and administration of intravenous medications in the Intensive Care Unit of shahid-sadoughi hospital in Yazd. J Pharm Care 2015;2:114-9. Moradi M, Moti T. Drug use evaluation of human intravenous immunoglobulin (ivig) in a teaching hospital in East of Iran. J Pharm Care 2016;4:70-4. Sohrevardi S, Shafiei A, Mirzania S. Intravenous immunoglobulin: A drug utilization review at shahid sadoughi hospital in Yazd. J Pharm Care 2015;2:170-6. Alangari AA, Abutaleb MH, Albarraq AA, Al-Dhowailie AA. Intravenous immunoglobulin utilization in a tertiary care teaching hospital in Saudi Arabia. Saudi Med J 2008;29:975-9. Stiehm ER. Adverse effects of human immunoglobulin therapy. Transfus Med Rev 2013;27:171-8. Brennan VM, Salomé-Bentley NJ, Chapel HM, Immunology Nurses Study. Prospective audit of adverse reactions occurring in 459 primary antibody-deficient patients receiving intravenous immunoglobulin. Clin Exp Immunol 2003;133:247-51. Cherin P, Marie I, Michallet M, Pelus E, Dantal J, Crave JC, et al. Management of adverse events in the treatment of patients with immunoglobulin therapy: A review of evidence. Autoimmun Rev 2016;15:71-81.